For the average consumer, purchasing a new smartphone might seem like the most complicated purchase they can make—maybe aside from a house or a car. However, the complicated phone-buying process overshadows an equally mysterious process—trading in a used device. What exactly happens to a used device once a consumer decides it’s time for an upgrade? 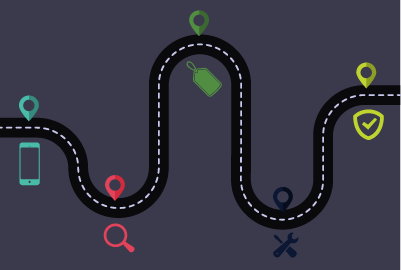 The journey varies depending on the channel—retail, online, or B2B—but getting the most out of a trade-in program means understanding each step of the process. In this journey, the trade-in process is initiated by customers walking into a carrier location or authorized retailer, often in the hopes of purchasing a new device. Initial Device Assessment: The sales rep takes the device from the customer and brings it to the HYLA point of sale trade-in platform. The software asks a series of simple yes/no questions meant to assess the physical condition of the device—does the device power on? does the device charge? Is there any noticeable damage? Value Transfer to Customer: After answering the assessment questions, the HYLA platform returns a value for the device. If the customer wants to proceed, it’s time to transfer the trade-in value. In the past, you might give the customer a pre-paid gift card, but now everything is electronic. Customers can automatically apply the trade-in value to the new device bill—or you can push high-margin accessories like cases and Bluetooth speakers. Moving the Used Smartphone Down the Line: The customer signs the contract for his or her new device and leaves the store with the understanding that their used device has been wiped clean of all data. The sales rep locks the used smartphone up in the back of the store until it’s sent along to the HYLA processing facility in the weekly delivery. When the used smartphone makes it to the processing facility, the post-inspection process starts. While the sales rep determined the trade-in process at the point of sale, we run a second assessment to determine if there are any value adjustments. For example, our automated post-inspection process might find that the $100 trade-in value for a used device should have actually been $50. Carriers are often able to make up this margin in the secondary market, but this is an important economic point of the used smartphone journey. Whether there are adjustments or not, the journey continues when the proper value is established. Device Is Good to Go: If the device is in working condition, it goes through processing to clear data a second time. The phone is then put away and ready to be sold. Used smartphones are typically worth about 50% more than their trade-in values—so our wholesale buyers pay us for those devices, we ship them, and we pass the margin to carrier partners. Phone Needs Repairs: In the processing facility, we can take care of some basic repairs—really anything that doesn’t require opening the phone. If more must be done, we ship the used smartphone to our repair vendors and they take care of issues like corrupt software or faulty internal components. When the used smartphone is back in working condition, the vendor ships the device back to our facility and then it follows the normal process until final sale. From here, the used smartphone can be distributed however the wholesale buyer sees fit. There are other nuances to the smartphone journey that we’ll cover soon, but first we have to go back and see how the process differs for channels other than retail. The used smartphone journey doesn’t change when you get to the processing facility. However, the first leg of the journey changes depending on your channel. Online trade-in programs give consumers an opportunity to get value for their used smartphones from the comfort of their own homes. They answer the same questions a retail sales rep does in-store and we determine the device’s trade-in value—making sure it’s clear that the value isn’t guaranteed until post-inspection is completed. We send a padded envelope and a pre-paid mailer along with specific directions for the used smartphone to be shipped to our facility. From here, we follow the same processing steps until we send a pre-paid gift card for the true value of the used device to the customer. The B2B channel is essentially the same as the online used smartphone journey—except it accommodates bulk orders from 5 to over 5,000 devices depending on the size of the business. The business logs into our carrier trade-in site, fills out an online form to describe the device models (and volume) being traded, and requests a quote. We offer a high level assessment of the devices and determine a value for the bulk trade-in, but the true value is determined after the devices have gone through post-inspection at the processing facility. What we’ve explained so far covers the majority of used smartphone journeys. However, not every used smartphone is put up for sale. Keepers for Insurance/Warranty Claims: Every month, carriers decide how many used smartphones they need to fulfill insurance and warranty claims. It’s far more economically efficient to fulfill these claims with used smartphones, so making sure carriers have enough devices for demand is a delicate balancing act. When we process devices that are deemed “keepers,” they are sent back to carriers rather than heading to market. The Non-Profit Path: Most carriers have a charity organization with which they are Some have bins in store that collect used smartphones from consumers who prefer not to follow the typical trade-in paths. These used smartphones are shipped to the processing facility and a check is written to the charity for the full value after inspection. Devices with No Value: Not every trade-in device is an iPhone in pristine condition. Some devices have virtually no value in the secondary market and won’t be appropriate for any insurance claims. These devices are marked for recycling. All data is cleared and a recycling vendor grinds or shreds the devices, saving precious metals and ensuring electronics don’t make it to any landfills. The journey of a used smartphone isn’t terribly complicated—however there are plenty of nuances to manage. If you’re constantly dealing with errors along the chain of processes and procedures, you’ll never realize the full potential of a trade-in program.